I remember spending two long years learning how to use a camera. It was all about getting to know the finer points — ISO, depth of field and lenses and so on — the knowledge you need if you want to take photos properly. I must admit I was surprised to hear everything I’d just spent two years on being dismissed so easily but later I realised he was absolutely right. No people equals no story. No story equals no interest. 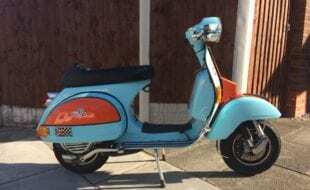 When I saw Marco’s machine for the first time, at a scooter event in my home town of Udine, Italy, it stood out against the usual backdrop of Vespas and two-stroke smoke like a sore thumb. It shot past me like lightning and I was too far back to catch him or even keep up, but like a sniffer dog I followed his scent and eventually tracked him down. I got his number and arranged to meet him at his place in Cortina d’Ampezzo, Veneto. The ride to get there was stunning. 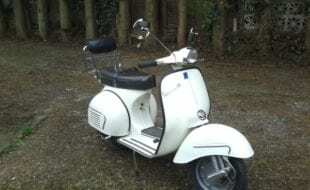 From the Friuli Venezia Giulia region where I live I took the number 52 to Veneto taking in three awe-inspiring mountain passes in the process. 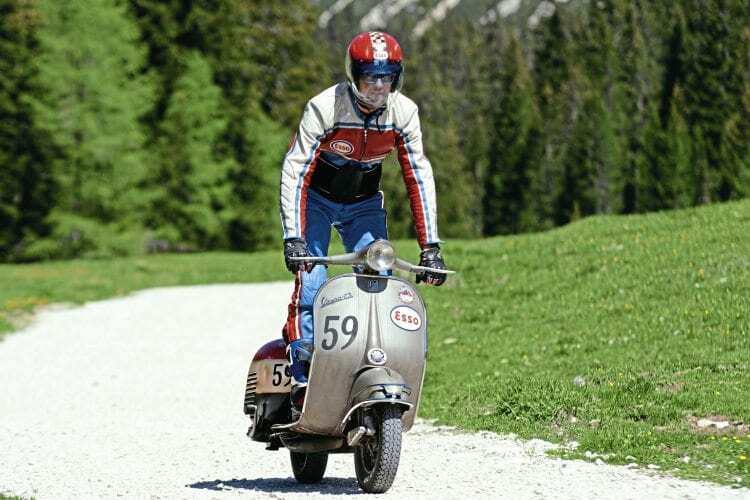 “You will notice a sidecar-VBB and find me at a shop called Cicli-Cortina,” Marco had told me when I rang him. I had my eyes peeled for it as I swooped down into Cortina. The city made its name as a fancy ski resort and sits in a valley surrounded by some of the tallest, craggiest and most cinematically beautiful mountains you’re ever likely to see. That’s why a dozen or so movies have been shot there to date, but for most residents there’s no Hollywood glamour or taste of stardom — they are hard workers with ordinary lives. Among them is Marco’s dad, the owner of Cicli-Cortina (Cicli means bicycles in Italian) for more than two decades. He’s a tall and silent but very active man who’s just reached retirement age. His shop has grown over the years and when you step inside the first thing that hits you is the contrast between its warm wooden furniture and the stock that’s displayed on it, which is the very last word in high-tech cycling clothes and accessories. 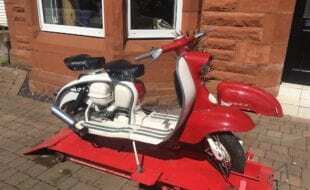 Even for a scooterist, this is a fascinating setup. 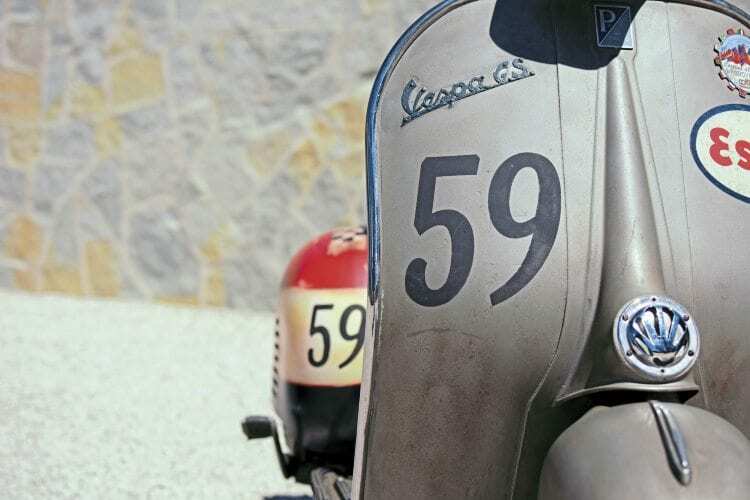 I’m just wondering where Marco might be when he appears from behind a small door marked with the Piaggio logo. “Welcome to my little piece of heaven,” he says with a genuine smile which firmly underlines this sentiment. 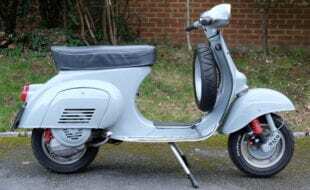 I follow him back through the door and spy the familiar outline of a GS-Vespa shrouded by a grey cover. As Marco beckons me over and begins to peel it back, I can tell immediately that I’m in the presence of a man who values detail: his custom GS has been meticulously prepared to remain within Italy’s stringent road rules. But I’m missing something… what is it? Now I see it. Three colours dominate the room: white, red and blue. 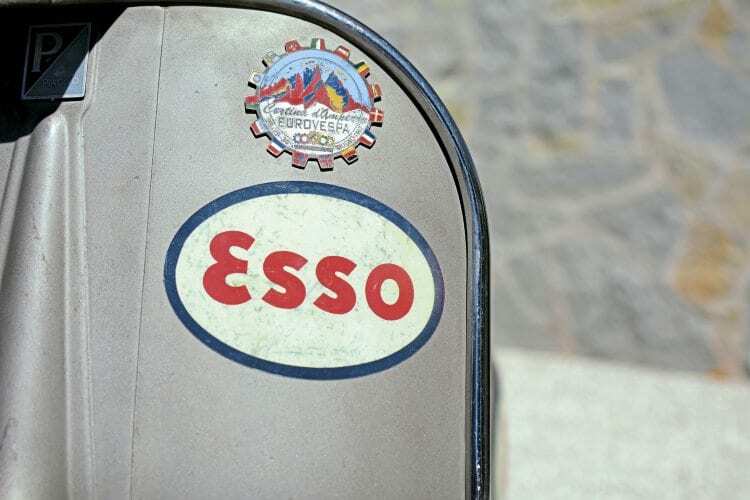 And there’s a logo that I now see is everywhere: Esso. “Don’t tell me that you’ve decorated your home like this too,” I enquire, incredulous. “Of course! You’ll see,” comes the reply. He’s joking. I think. 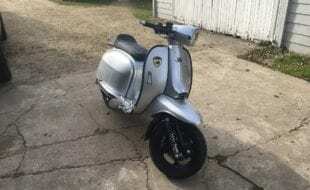 And just like that he shuts me up and shows me the scooter. The GS livery is designed as a clear homage to the Esso logo and I’m forced to admit that it’s something unique. Then there are Marco’s special white, red and blue riding clothes and the white, red and blue helmet. There’s a theme developing here. Just to the left of the spare wheel, on the central floor, an extra tank is fitted by means of a special bracket made by a local blacksmith. 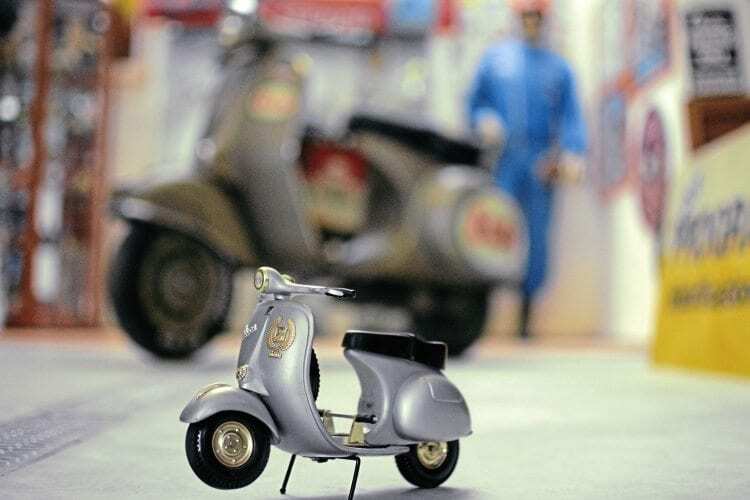 Everything from the keyholder to the brand of tyres has been specifically chosen by Marco. The machine has only recently been completed and has a mere 500km on the clock after running in. 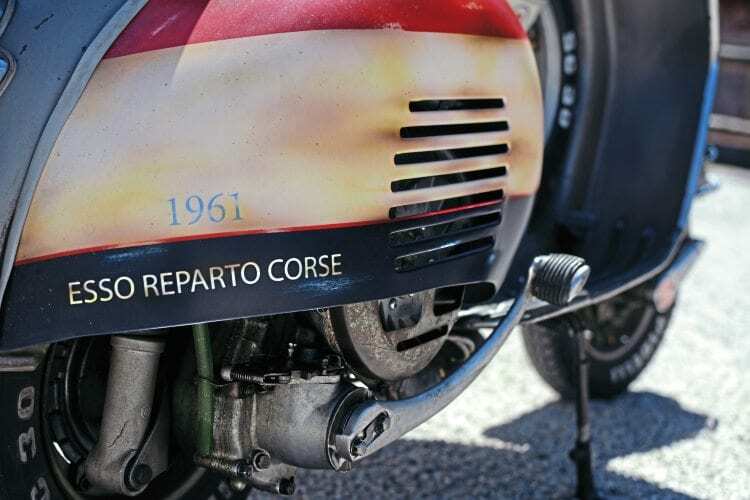 A couple of tweaks are needed, Marco says, including a new exhaust from two Italian brothers. 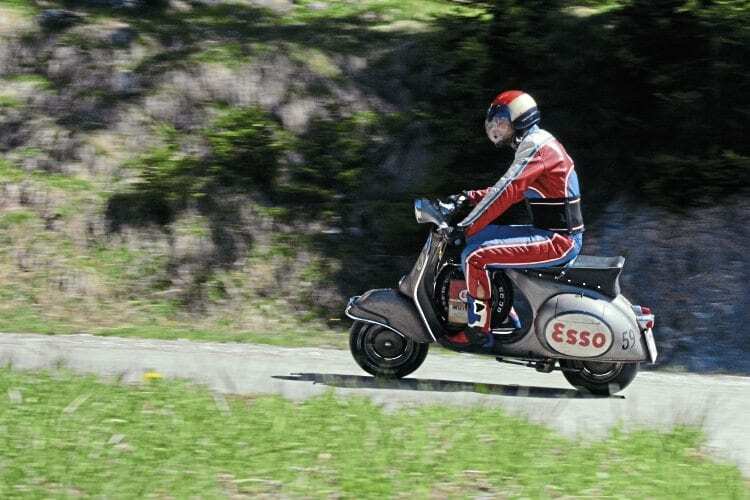 They have promised their pipe will add an extra 15kph to the scooter’s top speed assuming the engine remains the same. A 12v electronic loom means the bulbs give off proper light and there’s a Pinasco ignition for the spark. “I’m a 70kph man, there’s no need to rush here,” says Marco. It is time for a ride and as Marco gets into his themed outfit a change comes over him. I can barely keep him in sight as he rides into the top of the nearest mountain. He changes the driving style too, jumping on the GS floor while passing a white gravel road like an off-road rider. 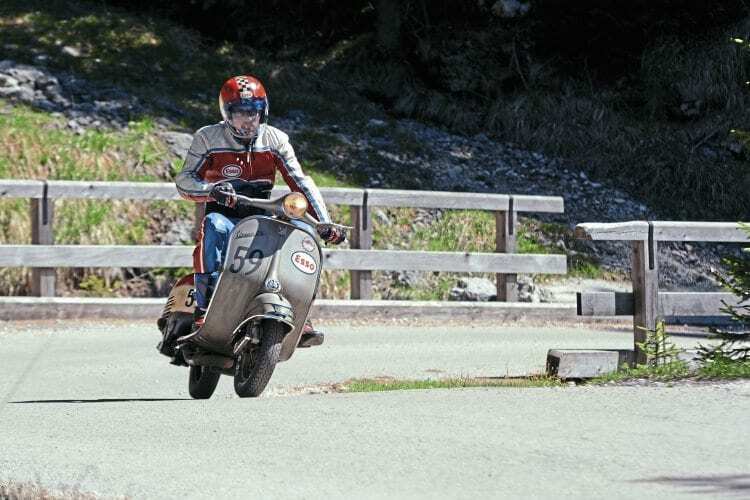 “I really hate downhills, I’m not very lucky with brakes,” he grunts, but as soon as the level changes he bites into the hairpins just like an eel fighting against the flow. We all have our speciality. The more time I spend with Marco, the more I understand what is driving his journey of discovery and identification. Then, all of a sudden his father arrives, kicking (gently) back the door. It is lunch time. Mr Devils Junior (an interesting nickname they give to Marco) offers to me some pasta inside his house. 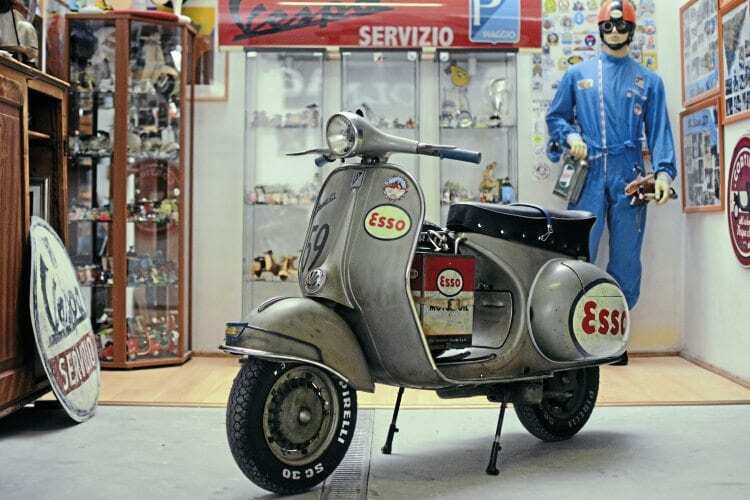 Believe it or not, he has a genuine vintage Esso fuel pump, along with a vinyl jukebox loaded with 30s to 50s records. If I ran Esso I’d give this guy a lifetime supply of fuel at least. 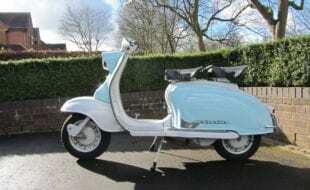 Born in 1955 and produced in five series up to 1961, the GS (Gran Sport) was inspired by the first racing model of the Piaggio scooter, the Vespa Sei Giorni (Six Days), and was an attempt to make the Pontedera scooter competitive with the small motorbikes of its time with a max speed of 100km/h. 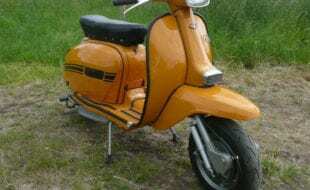 The engine was designed to run with a carburettor directly fitted on the cylinder, and the body was tapered for better air penetration. The first model (VS1) distinguishes itself from others in having cables that go outside the handlebars. 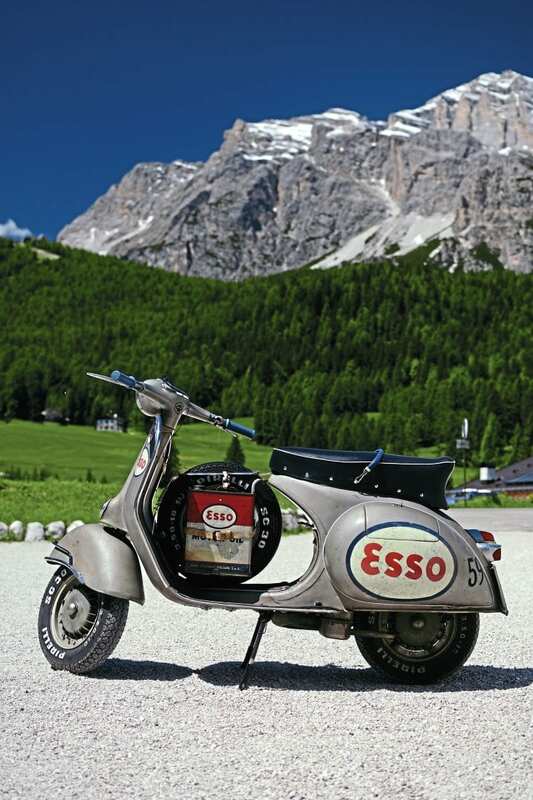 The GS 150 was a milestone in the history of the scooter, not only for Vespa bur for the entire industry. 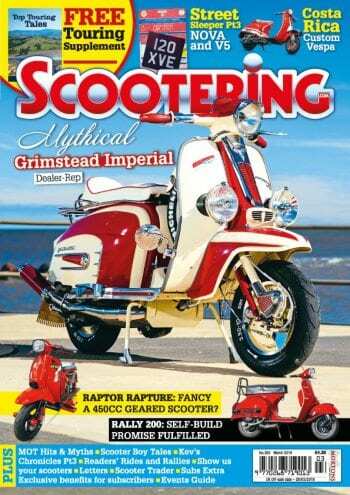 It is remembered by some as the most beautiful bike ever produced and still today is a sought-after model. In the 1950s, for the first time, the ‘quiet engine’ model was created that still had breathtaking performance. 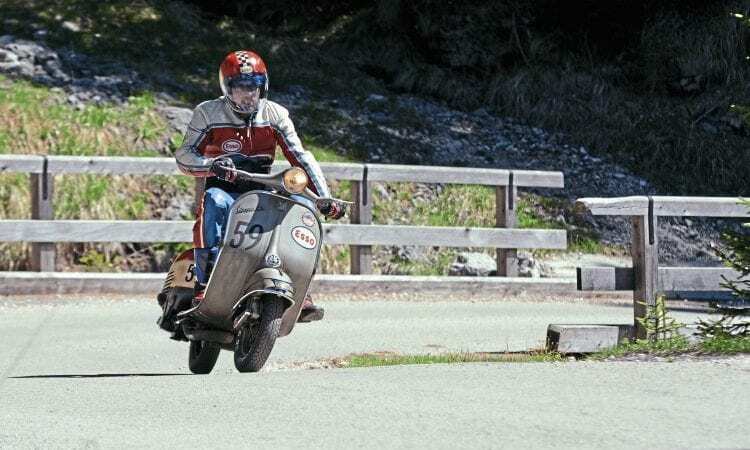 The Vespa 150 GS presented itself with sporting credentials, a direct consequence of the previous experiences of the Piaggio racing team. The engine benefitted from a direct intake and a four-speed gearbox. 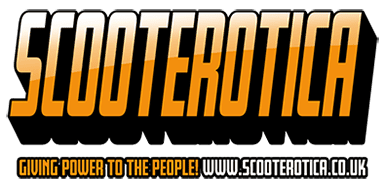 The scooter was able to provide great riding comfort and balance too, having a longer and wider seat and massive wheels. This model is so iconic that the MOMA (Museum of Modern Art) has decided to fit one inside its walls.